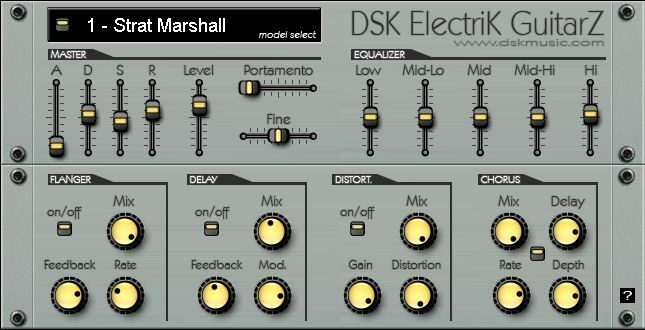 Free acoustic guitar synth DSK Electrik GuitarZ | VST A Day - One Free VST Every Single Day! Take note of the Sitar model. If you are looking for a Sitar VST to add to your collection this could be highly useful, and may enable you to get a more authentic sound to your Indian-themed recordings. In addition to all of the models present in this synth, there are also available Flanger, Delay, Distortion and Chorus effects. These, of course, should be very familiar effects for the electric guitarist, as they are some of the most commonly used effects in Rock and Electronic Dance genres. It is very convenient for DSK to have included them right on the front panel. There is also a present Master Volume section with standard Attack, Decay, Sustain, Release and Level effects. A tunable portamento, and pitch Fine Tune is also present. Overall, a lot of features are available to you through this VST.